Delegation to leave for Brazil to assist rescue effort after dam collapse kills at least nine people. Hundreds still buried under the mud. An Israeli aid delegation will take off shortly for Brazil to assist in the rescue effort following a dam collapse near the mining town of Brumadinho. Prime Minister Benjamin Netanyahu had spoken with Brazilian President Jair Bolsonaro on Saturday and offered to send aid, an offer Bolsonaro accepted. 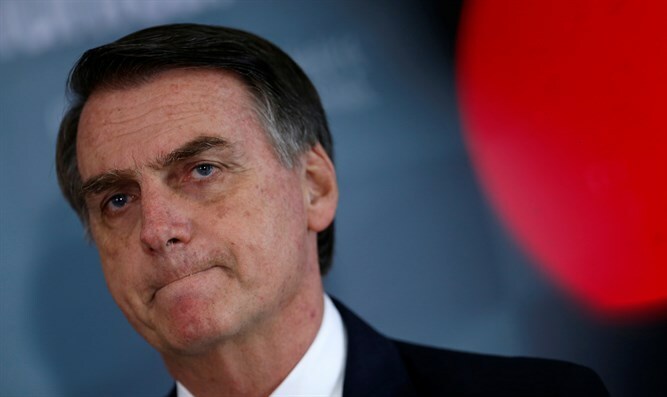 "I spoke with Israeli Prime Minister Benjamin Netanyahu and he offered to help us in our search for those missing in the collapse of the dam," tweeted Bolsonaro. "We would be happy to receive help and we thank Israeli technology for helping humanity." At least nine people were killed with another 300 missing after a dam collapsed in Brazil on Friday. The disintegration of the dam covered the area with thick mud and buried hundreds of people. Relations between Israel and Brazil have warmed recently followed the election of Bolsonaro as the country's president. Bolsonaro, who has been dubbed the “Trump of Brazil”, announced after his election that he intended to uphold his campaign promise and move the Brazilian embassy to Jerusalem. The Arab League recently warned Bolsonarothat moving his country’s embassy in Israel to Jerusalem would be a setback for relations with Arab countries.